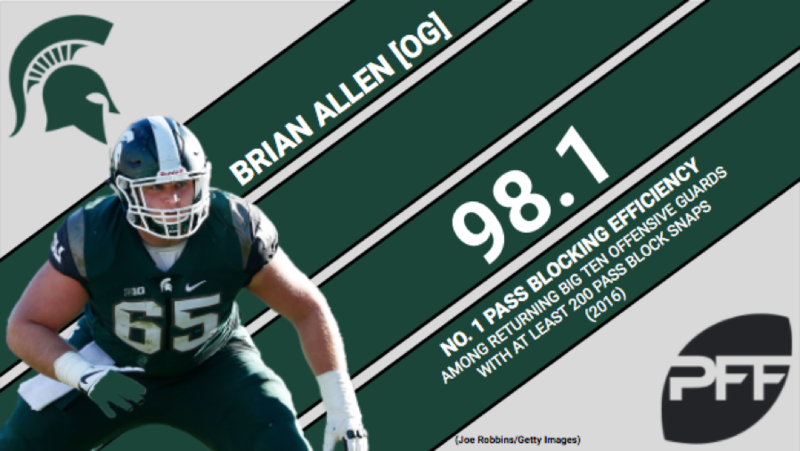 After allowing 22 total pressures in 2015, Michigan State G Brian Allen dropped that number down to 10 in 2016, which ranked him No. 1 among returning Big Ten guards with at least 200 pass block snaps in pass block efficiency (98.1). Allen also proved to be an impressive run blocker, as he had the 13th-highest percentage of positively graded run blocks in the 2018 draft class. For his combined efforts in pass protection and the run game, Allen ranked No. 2 behind Iowa’s Sean Welsh among returning Big Ten offensive guards in overall grade at 88.0.